(L-R):Chris Lloyd Vice President Maritime, of Thales Australia & New Zealand; scholarship recipient Benjamin Futterleib; Nicole Forrest Green, Lapérouse Education Fund; Senator the Hon. 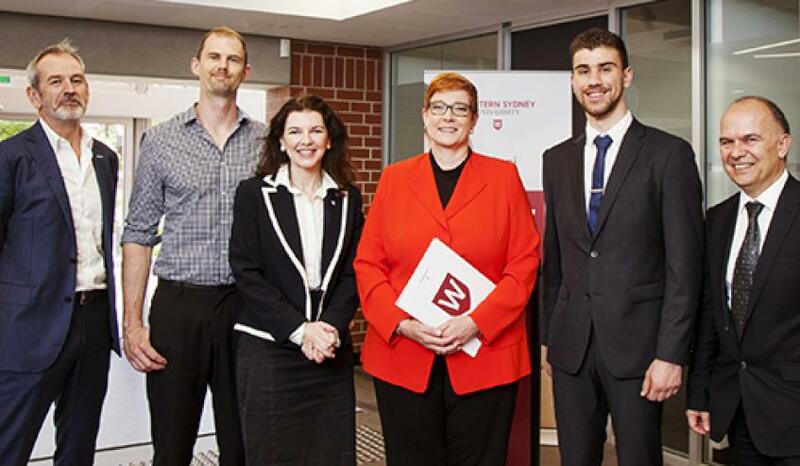 Marise Payne, Minister for Defence; scholarship recipient Daniel Farrugia; and Professor Simeon Simoff, Dean of the School of Computing, Engineering and Mathematics at Western Sydney University. Image via Western Sydney University. Two Western Sydney University students have been given the opportunity to study defence science work at a multinational defence and security company in France. Minister for Defence Marise Payne announced Daniel Farrugia, an engineering student from Silverdale, and Benjamin Futterleib, a computer science student from Pyrmont, have been awarded scholarships to spend six months on international exchange with the Université de Nice Sophia Antipolis (UNICE). While in France, both students will undertake internship positions with Thales' Underwater Systems business in Nice. At a time when submarines are high on the defence agenda for both Australia and France, the combined scholarship and internship positions with UNICE and Thales present a unique and exciting opportunity, Western Sydney University said. The unique partnership between UNICE, Thales and Western Sydney University was initiated by Nicole Forrest Green from the Lapérouse Education Fund – which has donated $10,000 towards the scholarships. The Lapérouse Education Fund promotes educational exchange between France and Australia in the context and in the spirit of the French Enlightenment and the scientific discoveries of Jean-Francois de Galaup, comte de Lapérouse. “Lapérouse was a man of dignity, respect and courage with an eye for new horizons and discoveries. It was in this spirit that award recipients of this innovative scholarship were assessed,” Forrest Green said. Professor Simeon Simoff, dean of the School of Computing, Engineering and Mathematics at Western Sydney University, said the University welcomes this kind of collaboration with community and industry. "Daniel and Benjamin are receiving a life changing opportunity and we look forward to continuing this close working relationship with the Lapérouse Education Fund and with Thales," Professor Simoff said.